Chartered in 1888 as the state's Agricultural Experiment Station, the University of Rhode Island, with an original graduating class of 17 students, now offers its more than 16,000 students the choice of 100 undergraduate and 80 graduate programs. Entering freshmen receive an average financial assistance package of $9,631.The URI Alumni Rhode Island High School Scholastic Scholarships program grants ten $1,000 awards each year to beginning Rhode Island students with an excellent academic record. Freshmen who are majoring in economics or business administration with demonstrable financial need may be eligible for the URI-Bank of America Scholarship ($2,000/year). The Independent Insurance Agents of Rhode Island Scholarship awards $2,500 each year to outstanding students in the risk management and insurance field. Rhode Island has a real lack of state financial aid, meaning students must seek opportunities to lower their higher education costs. To be fair, the state government does give one need-based award, and the Rhode Island Student Loan Authority (RISLA) provides loans with cheap interest rates. But private foundations have stepped in to provide merit-based scholarships. This benefits Rhode Island residents applying to out-of-state schools because, unlike state funds, most private awards aren’t tied to public colleges. In addition to applying for these awards, students should request financial aid from the college they’ll be attending. At Community College of Rhode Island, that means applying to CCRI Foundation scholarships. At University of Rhode Island, however, just file the Free Application for Federal Student Aid (FAFSA). 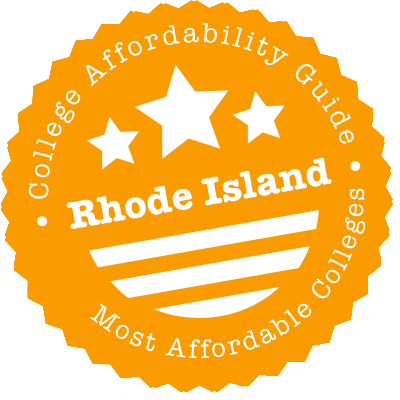 An affordable college education is within reach in Rhode Island — we’ll show you where to look. Rhode Island does not offer much in terms of statewide formal transfer agreements. Course and program equivalencies are determined on a course-by-course basis by each institution. However, many schools work together, and there is a guaranteed associate degree transfer from the Community College of Rhode Island. Rhode Island colleges and universities offer course-to-course equivalencies depending on school articulation agreements and policies. Typically, schools have a minimum grade requirement, and may have residency requirements and limits on the age of transfer credit. Students with an Associate of Arts degree can transfer their degree to Rhode Island College or the University of Rhode Island. Students must have a grade point average of at least 2.4 for guaranteed admission and transfer. To find out how course equivalencies work for some of Rhode Island’s colleges and universities, visit RITransfers.org. There, you can search for equivalencies and generate an equivalency report. There are multiple resources — both online and physical — to use on your quest for a cheap college education in Rhode Island. You should first visit the Division of Higher Education Assistance (DHEA), which is part of the Rhode Island Office of the Postsecondary Commissioner (RIOPC). It features basic information on the state’s three public higher education institutions: University of Rhode Island, Rhode Island College and Community College of Rhode Island. It also has financial aid info; one of its most useful references is the Rhode Island Financial Aid Handbook, which elegantly explains how to obtain college funding. Another place to reference is the Rhode Island Student Loan Authority (RISLA). The most important thing about this website may be its scholarship search tool for local awards. You can find more scholarships at Rhode Island Foundation, whose funds include the Patty & Melvin Alperin First Generation Scholarship, the Rhode Island Commission on Women/Freda Goldman Education Award, and the Edward J. and Virginia M. Routhier Nursing Scholarship. RISLA also runs the College Planning Center or Rhode Island at three physical locations, and prospective students should make appointments there to get personalized help researching colleges, navigating admissions and completing financial aid applications. You can get some of the same assistance from the comfort of your home by visiting WayToGoRI.org. It helps you plan your high school course schedule to maximize your chances of acceptance (and aid) in college, walks you through the college application process, and builds a customizable financial aid plan to make school affordable. For help specifically with the FAFSA, College Goal Rhode Island is there. It runs free workshops every January at area high schools. If you’re headed to Brown University, Providence College, Rhode Island School of Design or Roger Williams University, you’ll have to create a CSS/Financial Aid PROFILE to be eligible for institutional scholarships and grants. The last place to look, the CollegeBound Saver, is most relevant if you are a few years away from starting college. It’s a 529 fund for state residents that allows you to not only earn interest toward what you save for school, but also write off some of your contributions on state and federal taxes. Summary: Though called a scholarship, this is really a need-based grant that distributes up to $4,000 to state students. Eligibility: Recipients must attend a public college in Rhode Island, each of which sets different eligibility criteria in terms of GPA, enrollment status and expected family contribution (EFC) as calculated on the FAFSA. How to Apply: Submit the FAFSA. If you qualify, the school will credit money to your account. Summary: Students with an EFC of $12,800 or less should spend 10 minutes applying for this need-based scholarship. Twenty-five Rhode Islanders win via lottery each year. Eligibility: Rhode Island residents may apply. They must be present or send a representative to the award ceremony. How to Apply: Apply through RIScholarships.com by May 1st. As part of the application, you must complete the FAFSA and submit a copy of your Student Aid Report (SAR). You must also send proof of acceptance. Summary: Two Rhode Islanders can get a one-time infusion of $20,000 to enter a U.S. law school. Eligibility: The scholarship committee awards funds based on candidates’ financial need, academic performance, community service and intent to practice law in Rhode Island. How to Apply: Submit an application to the Rhode Island Bar Foundation by March 31st along with a personal statement, transcripts, copies of your SAR and federal tax return, and two letters of recommendation. Summary: One out of every 25 Rhode Islanders is Polish-American. With this scholarship, they can get a nonrenewable scholarship to enroll in an accredited college. Eligibility: Rhode Island high school seniors of Polish-American descent or members of a Polish-American organization in the state may apply. They must earn a 3.0 GPA to be eligible. To receive funds, they must be present at the award ceremony. How to Apply: Download a scholarship from the foundation’s website. Submit it to the foundation by February 15th with transcripts, three letters of reference, tax and income documents, a personal statement and a one-page essay on Polish affairs. Summary: 12% of Rhode Islanders claim Latino heritage. They can also claim funds for undergraduate studies in the U.S. Eligibility: Rhode Islanders with at least one Latino parent may apply. How to Apply: Log in to the Scholarship America Dollars for Scholars Student Center and create a profile, which serves as the base of your application. Through the Student Center, you must also submit transcripts, financial documents and a letter of reference. Applications become available in January. Summary: Seniors from 35 participating public high schools can earn $1,000 toward their freshman year in college anywhere in the U.S. Eligibility: There are no minimum requirements, but the Red Sox Foundation awards funds on the basis of academic performance, community service and financial need. How to Apply: Email an application by March 4th to nescholarship@redsox.com. It should include your SAR, transcripts, a written essay and a letter of recommendation. Summary: Undocumented Rhode Island residents can get $500 to enroll as freshmen in a U.S. college or continue their studies at a public college in the state. Eligibility: Students with demonstrable financial need and academic potential are eligible. Students who receive the award must serve as mentors to other undocumented students afterward. How to Apply: Apply online by February 17th. Required documents include transcripts, a personal statement and two letters of reference. Summary: Doctors, dentists, nurses and other medical professionals working in nonprofit facilities can get a portion of their loans paid by the state Department of Health. Eligibility: Health professionals must be licensed and agree to full-time employment in a qualifying profession in a Rhode Island Health Provider Shortage Area (HPSA) for two years (or part-time for four years). The facility they work at must accept sliding fee payments. How to Apply: Download an application, and return it with documentation of your professional status, credit and loan information, and signed forms from your employer. Summary: Internships during college aren’t only great for building a resume — they can also net you $2,000 toward college loans repayments. Eligibility: To qualify for loan forgiveness, the internship must be worth three credits but not be a requirement for the major. Moreover, the student must go on to graduate. Two types of loans are eligible for forgiveness: RISLA Student Loans and RISLA Parent Loans. Both Rhode Island residents and enrollees at RI colleges can apply. How to Apply: After completing your internship, download an application and send a completed version to RISLA along with a transcript. Summary: Borrowers holding a RISLA Student Loan or RISLA Parent Loan issued between July 2011 and June 2017 can pay 0% interest for four years, even if they’ve already graduated. Eligibility: Licensed registered nurses working at least 20 hours a week in a healthcare facility in Rhode Island are eligible. How to Apply: Submit the Nursing Reward Program Application to RISLA, either before or after graduation. Summary: Nurses typically earn more than those who teach nurses. This program seeks to partially address this imbalance by giving new nurse educators $20,000 over four years toward their student loan bills. Eligibility: Anyone hired since April 2012 to teach at a Rhode Island college licensed by the state board of nursing is eligible, provided they have remaining debt on their student loan, whether it’s from RISLA or another lender. How to Apply: Once you secure employment, submit the Nurse Educators Loan Forgiveness Program Application to RISLA. Summary: RISLA distributes $1,500 to $40,000 in low-interest loans annually to each eligible student. Eligibility: Rhode Island residents and out-of-state students coming to Rhode Island for college are eligible. Their immediate family must earn at least $40,000 a year. How to Apply: Start by agreeing to a credit check. If you are pre-approved, you must submit supporting documents to verify your financial situation and enrollment status. Summary: Rhode Islanders working in a science, technology, engineering or math (STEM) profession in the state can get a tax credit toward college loan repayments — from $1,000 for associate degree-holders to $6,000 for graduates with a master’s. Eligibility: The committee judges applications based on the likelihood of the award to keep them in Rhode Island, how critical their field is to Rhode Island’s economy, and their financial need. How to Apply: Submit an application by June 15th to Commerce Corporation. It should include an employer endorsement, resume, transcripts and loan documentation. Summary: Active duty Rhode Island National Guard members killed while serving won’t leave behind unpaid college bills for their spouses and children. Instead, their dependents receive free tuition at the state’s public colleges. Eligibility: Children must enroll before their 22nd birthday and have four years to complete a bachelor’s degree (fewer for an associate). How to Apply: Contact your school’s financial aid office. You must have documentation of death and proof of your relationship to the deceased. Summary: A full or partial disability due to military service earns Rhode Island veterans a 100% reduction in college tuition. Eligibility: Veterans must already be admitted and registered at a public college in the state. Summary: This nonrenewable scholarship goes to active or retired Rhode Island National Guard members or their children. Eligibility: High school seniors and graduates may apply for a NGARI scholarship to attend a baccalaureate program. Although there are no minimum eligibility criteria, awards go to the highest-achieving applicants. How to Apply: Submit an application to NGARI by May 31st along with transcripts and College Board exam scores. Summary: RI National Guard members get five free courses a term (minus books and fees) to attend one of the state’s public colleges. Eligibility: Active members qualify to take courses toward certification or associate, baccalaureate or master’s degrees. They must earn at least a C+ in each course. How to Apply: You must first be accepted at a state school. Then, contact the school’s financial aid office to learn what information it needs to apply the waiver. Summary: National Guard members who want to finish their degree in record time can add two free summer courses to go along with their STAP benefits. How to Apply: Apply for both the Montgomery GI Bill and financial aid from your college first. Then, contact the National Guard’s education office to receive a STEP certificate. Summary: Also known as Tuition Break, this program gives Rhode Island residents a deep discount for enrolling in another New England college. Eligibility: Students must enroll in an eligible bachelor’s or graduate program. Some programs have additional requirements. How to Apply: After being accepted to a participating college, declare your major in a qualifying RSP program. When it comes to making college affordable, think bigger than the cost of admission. After all, even tuition waivers don’t cover living expenses. Fortunately, three state departments fund a comprehensive range of social programs for people just like you. If it’s a cheap place to rent you need, look to Rhode Island Housing, which facilitates the Housing Choice Voucher Program and the Project Based Voucher Program. Both subsidize rents for low- to moderate-income families, with the latter program tied to specific units. Worried about getting sick? The Rhode Island Department of Health links you to affordable primary care centers, distributes WIC funding for pregnant and nursing women to get free nutrient-packed food, and sets up walk-in clinics where you can get cheap immunizations (which you’ll need for college anyway). Are you worried about expenses piling up? The Rhode Island Department of Human Services can link you to SNAP (food stamps) so you can afford groceries, sign you up for the Child Care Assistance Program so you can put your kids in day care, enroll you in Medicaid so you are protected if you get sick, and subsidize your utility bills when you have to turn up the thermostat. Not all colleges have on-campus housing. Students at Community College of Rhode Island, for instance, must look elsewhere. But most four-year colleges these days encourage incoming students to live on campus. Freshmen and sophomores usually find themselves in a residence hall or living learning community (essentially, a residential hall based on a shared academic or social interest), while upperclassmen can move into a campus apartment. Both options are viable alternatives to commuting to campus because schools offer affordable rates that are inclusive of utilities, internet, furniture and security. Johnson & Wales, for example, has six housing levels. Getting a further discount on campus housing can be tough, but it’s possible in certain circumstances. Take URI. Students who volunteer to take on a second roommate and live in a “triple” receive a partial refund. Before you make a decision, compare on-campus to off-campus living costs. Rhode Island has a higher-than-average cost of living, which is typical for states in the Northeast. Renting a home or apartment is reasonable, but utilities, transportation and groceries will drain your wallet. These are all things students can avoid — for a few years, at least — by moving into a campus residence hall or apartment and buying a meal plan. But if you want to give off-campus living a go, most colleges in Rhode Island will help you get started. Providence College’s Office of Citizenship and Off-Campus Life informs students about city ordinances, educates them about rights and responsibilities, and links them to a housing search tool powered by JumpOffCampus. Roger Williams University has a similar partnership with JumpOffCampus; unlike URI, however, it does not have a physical address on campus. URI’s students can step into the Commuter Affairs Office and/or use its online Off-Campus Housing Database to find a place. Students without college-specific resources can look to Rhode Island Housing, which publishes a renter’s guide featuring subsidized apartments, public housing and shelters. Find more of the latter by scanning the Rhode Island Shelter Guide put out by the Rhode Island Coalition for the Homeless. If things aren’t to that point, search for subsidized places to rent on HomeLocatorRI.net or visit RILiving to see housing in all price ranges. Many residents rely on the state’s utility assistance programs to manage their energy expenses. The Department of Human Services administers three programs. The main one is the Home Energy Assistance Program (HEAP), which is a grant to cover heating bills of residents earning less than 60% of the state median income. If you qualify for HEAP, you can apply for the Weatherization Assistance Program (WAP), which takes a long-term approach to reduce heating bills: It pays for home repairs that will cut energy costs. Last, the Heating System Repair/Replacement Program (HSR) is a one-time grant for HEAP-qualifying homeowners who have outdated heating equipment. Apply for all three programs at your local community action agency, which may also direct you to utility assistance initiatives from charities. If you need medical attention in Providence (or pretty much anywhere in tiny Rhode Island), you may end up at one of the seven hospitals affiliated with Brown University’s medical school. Let’s assume, though, that you have merely routine medical needs that can be served by a campus clinic. Before registering, you should look at the school’s health center policies, as they vary from campus to campus. At Brown University, once you pay the health services fee on your tuition bill, you’ll be able to access most Health Services programs without paying an additional cent. At Bryant University, office visits are free, although you’ll have to pay for some services, such as immunizations. One thing you’ll typically never have to pay for at a campus clinic is counseling. It’s standard practice for students to have short-term psychological counseling options right on campus for free. More expansive services may require a trip off campus. The Rhode Island Council of Community Mental Health Organizations maintains a list of places to go for affordable mental and behavioral health treatment, while the Rhode Island Health Center Association (RIHCA) keeps a similar directory of community health centers. Go there and you’ll find clinics that set rates on a sliding scale. 12 of the 29 also have dental services. The state Department of Health has its own list of free or low-cost dental clinics; some of the sites overlap with the RIHCA’s listings. One location it highlights is the CCRI Dental Hygiene Clinic at the Flanagan Campus in Lincoln, where you can get a cleaning for just $20. Since it’s a teaching clinic, however, visits take about twice as long as standard dental appointments. Got young kids? Figuring out where they’ll go while you’re at school can be a headache. But it doesn’t have to be. URI runs two Child Development Centers, one each for three- to five-year-olds at its Kingston and Providence campuses. They are open to the entire community, so they’re priced for working families instead of studying ones. But enrollees at URI’s Providence campus can apply for the Lillian Feinstein Scholarship, which is reserved for students. Elsewhere, Rhode Island College’s Cooperative Preschool is a quirky option for Providence parents. It keeps costs low by mandating parents commit time each month as teaching assistants. Even colleges without campus child care often address the issue on their website and can point you toward resources. Before registering your child in a program, make two stops online: one at the RI Child Care Provider Directory, where you can find licensed facilities for all ages, and Rhode Island Child Care Assistance Program, where you can apply for a subsidy to lower your expenses at most facilities. To drive or not to drive? Rhode Island Public Transit Authority (RIPTA) bus stops are around every corner, and train stations dot the landscape. But cars are convenient for trips to Costco and IKEA. Looking over your college website’s Parking and Transportation section may help you solve this quandary. These web pages point out parking fees and feature student deals on RIPTA. Providence College students ride free, for instance, and URI students and JWU students get deeply discounted passes. Regardless of whether you choose public transportation or a car, when class starts in 10 minutes you won’t want to run to the other side of campus. That’s why University of Rhode Island, Rhode Island College and Johnson & Wales University all have campus shuttles. College students are notorious for surviving on pizza, cheese puffs and soda, but many students can’t afford the essentials for a meal, especially because groceries in Rhode Island cost more than the national average. Most colleges in Rhode Island have yet to join the campus food pantry movement, but URI’s intermittently active Rhody Outpost Emergency Food Pantry is a good start. For permanent pantries, use Rhode Island Community Food Bank’s interactive map. Last, the state makes sure pregnant and nursing mothers never survive on cheese puffs, let alone go hungry. The Department of Health runs the state WIC program, an initiative that lets pregnant women and mothers of young children “shop” for free staples from their grocery store each month. If you wanted to, you could get on a train in Providence and be at URI’s main campus in Kingston in 40 minutes. Why would you do this? For one, because Providence is the capital and the center of arts and culture. For another, you’d save a bundle on living & housing costs. For a northeastern capital city, Providence is surprisingly affordable. The savings there will cover your train tickets or bus passes, which are free anyway for Providence College students and discounted for students at other nearby colleges. Community Action Partnership of Providence (CAPP) is the place to sign up for many state benefits, including the Home Energy Assistance Program and Weatherization Assistance Program. If you earn less than $52,000 annually, CAPP volunteers will do your taxes. If you run out of food, it has a food pantry for residents in the 02907 ZIP code. And if you are coming up short for college, its Individual Development Account Program will match whatever you save. Providence Community Health Centers will treat you regardless of your insurance status. They can help you apply for medical coverage under the Affordable Care Act or adjust your payments to your income. They have a full range of standard medical services, including dentistry, at 10 locations. Providence Housing Authority (PHA) runs five subsidized apartment buildings for city families, and residents get more than just a place to live. PHA provides summer programs for youth and financial literacy training and other programs for parents. Those who want to live in a non-PHA site may qualify for a Section 8 Housing Choice Voucher good toward rent on a home or apartment. Rhode Island Legal Services helps low-income families with noncriminal issues related to family matters, housing, employment, government benefits or consumer disputes. On a pro bono basis, its lawyers will help you avoid eviction, apply for state assistance, negotiate medical bills and, basically, make sure your basic needs are met. Swearer Center for Public Service is an initiative run by Brown University student volunteers. One program to look for is its SAT prep and college application tutoring. It’s aimed at high school students who are overwhelmed by the process. The city’s official guide for government services and nonprofit agencies is Resource Connections Guide 2010. Though useful, it is dated, so crosscheck with United Way of Rhode Island’s 2-1-1 service. Warwick is just 12 miles down I-95 from Providence, close enough to house the capital city’s airport, so don’t expect much variance in cost of living between the two cities. Instead, the difference is mainly in lifestyle. Where Providence is urban and lively, Warwick is suburban and sleepy. Where Providence is filled with young single people, Warwick is a place for older folks with families. In Providence, around half of homes go to renters; in Warwick, only a quarter do, with most homes occupied by their owners. Comprehensive Community Action Program is based in Cranston but has several programs in Warwick, including the Learn to Earn program, which provides free GED classes and college assistance courses for people looking to go back to school. You can also access low-cost medical or dental care at one of its two Warwick clinics. Kent County YMCA runs the Y’s Owl Preschool for three- to five-year-olds, which is roughly half the cost of some campus-based child care facilities. Need more? It also oversees Out of School Time, a before- and after-school program for kids at area elementary schools. Westbay Community Action does nearly everything. It runs a licensed child care center for kids from 18 months to 12 years old. Its Adult Education Academy gets you ready to ace the GED and move on to college. It can sign you up for free groceries through WIC, or lower your utility bills by helping you apply for HEAP or WAP. It also manages Westbay Marketplace, the regional food pantry, and will even help you do your taxes as part of the Volunteer Income Tax Assistance program. For more organizations serving Warwick and Kent County residents, look at 2-1-1 at United Way of Rhode Island’s website.